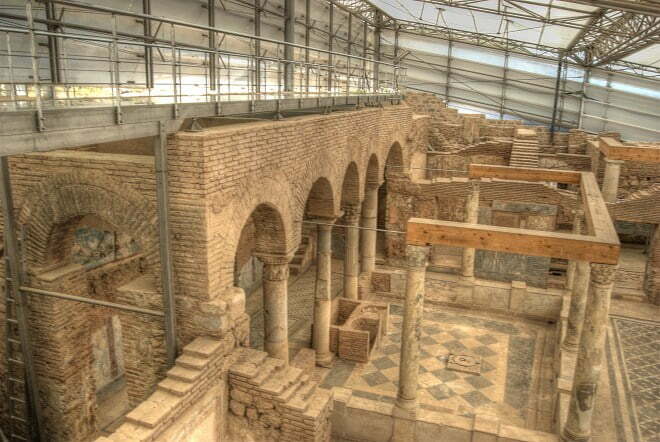 When the Roman terrace houses of Ephesus opened up to the public, I was absolutely thrilled. 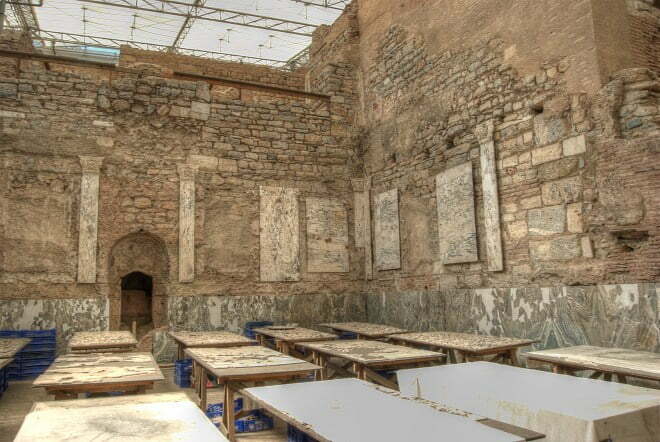 I had listened with jealousy as other people described the extensive finds of pain-staking excavations and read with envy as other bloggers wrote about how much they enjoyed their visit to the new attraction and significant landmark of the ancient city. Often postponing planned visits again and again, I finally made it back to Ephesus in March of this year. 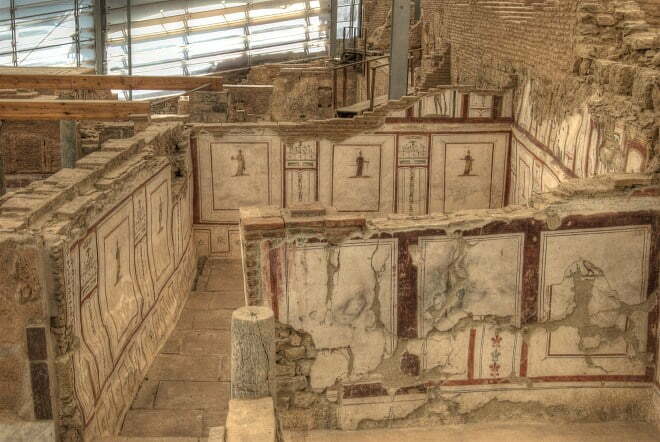 As well as the entrance fee to Ephesus, I had to buy another ticket to see the houses, and this bumped up the cost considerably, but I was sure it would be worth the money. After walking down the main cobbled Curetes Street, and passing by the upper gymnasium baths and Temple of Hadrian, I finally came to the entrance of the Roman terrace houses, sitting close to the grand Library of Celsus. I had expected queues to be long, yet walked straight in, without waiting. The houses are covered with a large rectangular glass dome, so I expected to hear a lot of hushed whispers but heard nothing. There was just pure silence. It turned out; I was the only one experiencing such eagerness to see the houses. Nobody else was in there at all! Looking on the bright side of things, the lack of crowds meant more room to move about and I could take photographs in peace without being prodded and poked. Starting off at the ground level, a platform leads around the houses that were built on a small hill. Passing by gave me a view of the ancient mosaics, and paintings but it was not until I reached the upper level of the platform that I was able to see the geographical layout of the houses, with narrow alleyways running in between them. My guidebook says most of the houses were constructed in the 1st century by extremely rich citizens. Such was their wealth, they could afford luxuries such as underfloor heating, clean water, and lavatories, inventions which at that time, were not available to the mass public. Standing on the top platform, overlooking the houses, I saw two girls rush by me. They were eager to get out and obviously non-fazed by what they had seen. 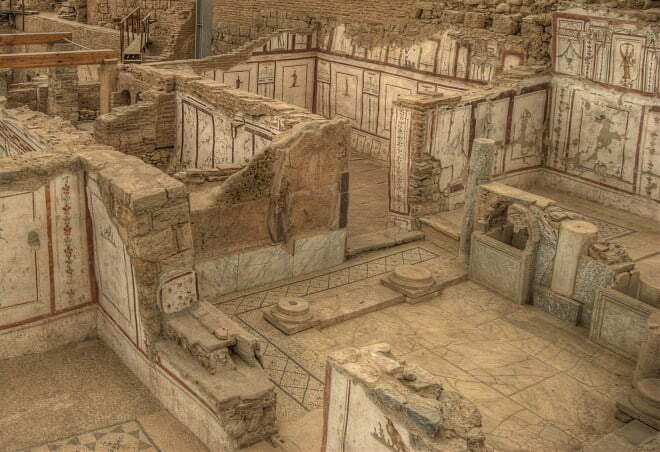 Maybe my excitement was a state of unnecessary frenzy but in my opinion, the extra cost of visiting the Roman terrace houses of Ephesus is totally worth it. We are traveling to Turkey and want to tour the Terrace Houses, but we don’t know the cost to enter the site. Would you be able to tell us what to plan to spend for the tour? this is an epic place to be! First saw them before they were open to the public when we managed to tag onto the back of an official delegation and the very kind security guys turned a very blind eye. 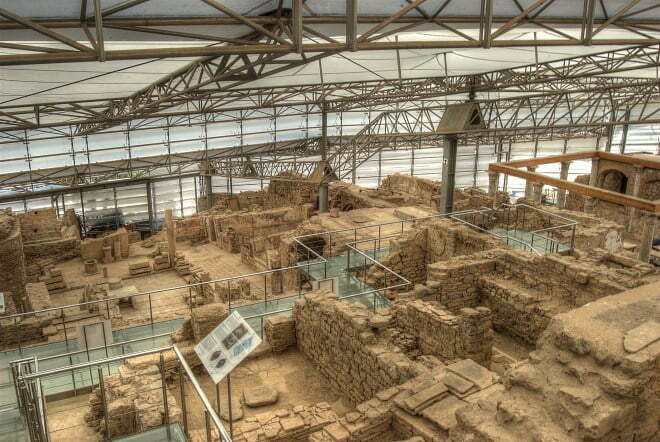 As an insight into life nearly 2000 years ago the site is without peer. ‘Bucket list’ material if ever there was a candidate! No Bron – not one storey from what the guide books say. They also say 6 houses as well I think. The “ballroom” is still there. I remember because it blew me away too. I visited these well over 10 years ago ? Don’t know about now but one entered by a narrow staircase with a small fountain in the wall. I remember being totally blown away by the enormous “ballroom” of one home where parties / entertainments were held. The area being made up of a number of houses (was it 6 , Natalie ?) They didn’t seem very big – although the rooves and possibly some attic space or even floors might have been missing. Were they all definitely one storey ? 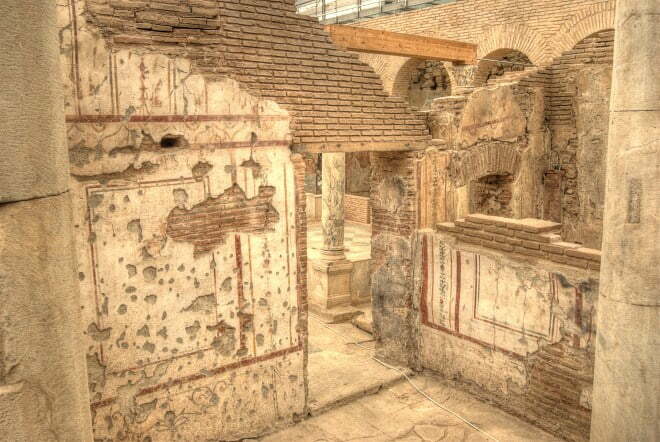 Thank you for sharing this virtual visit to Ephesus & the terrace houses today. Such historical value! It sounds like a photographer’s dream, a great opportunity with no crowds (or rain). I would be excited too! I remember Ephesus from the 1980’s. I hope things continue to be restored and saved for prosperity. Again, Çok te?ekkür ederim, the photos and narrative were very much appreciated and enjoyed. Great post, Nat. Ephesus may have had ‘monumental’ carved into every stone, but it is the glimpse into the mundane that really brings the place to life.